Ascending Butterfly has always been an empowerment community that advocates health and beauty from the INSIDE out, a big part of looking good and feeling confident is by feeling good on the inside, both mentally and physically. Making wiser snack choices and adding supplements where your diet is currently failing you is a great way to boost your system, I recently became a Bulu Box Brand Ambassador to help me widen my health product brand choices and then share it all with my butterflies of course! I know there is an insanely wide variety of Monthly Box Subscriptions Services out there, and trying to figure out which ones are the best for you isn't always an easy decision, but with Bulu they are curating a wide variety of vitamins, snacks and supplements so you don't have to, they do the leg work, and you just sit back, try it all and figure out what works best for you. Do you have someone special in your life who is trying hard to make lifestyle changes? This box is a great way to give that person a month or a year of healthy and happy at a price that certainly beats what you currently pay to indulge a daily coffee habit! And the choices in this box are way better than a daily coffee habit that's for sure! Ƹ̵̡Ӝ̵̨̄Ʒ - The Good Bean - A Roasted Chickpeas snack! Ƹ̵̡Ӝ̵̨̄Ʒ - Quest Chocolate Chip Cookie Dough Protein Bar - Gluten and Sugar Free Protein Bar, high in fiber and low in calories. Muscle Building Protein and great chocolate chip cookie dough taste, UM YES PLEASE! Ƹ̵̡Ӝ̵̨̄Ʒ - RUNA Tea - The key ingredient in this tea is Guayusa (pronounced GHY-YOU-SA) is an amazonian super-leaf that balances caffeine with polyphenol antioxidants which provides you with clean and steady energy to make you feel "Runa" - fully alive. Ƹ̵̡Ӝ̵̨̄Ʒ - Shapeology Burn Blend - This is a dietary supplement that mimics the effect of a high metabolism, helping you to burn more calories and loose weight faster, in a liquid delivery system for even faster results. Ƹ̵̡Ӝ̵̨̄Ʒ - Garden of Life RAW Organic Protein - Can be used as a meal replacement or post workout drink, it is vegan, gluten, dairy and soy free! I actively try to make the healthiest choices for myself on a daily basis, but like everyone else I have my bad habits too and I appreciate that Bulu Box is a great reminder to take better care of myself, try out supplements that are new to me and find products that help me to become a healthier and happier butterfly! Have you tried Bulu Box? If you have, do you have a favorite product that you learned about via Bulu? FTC Disclosure: This is NOT a sponsored post, no monetary compensation has been received. 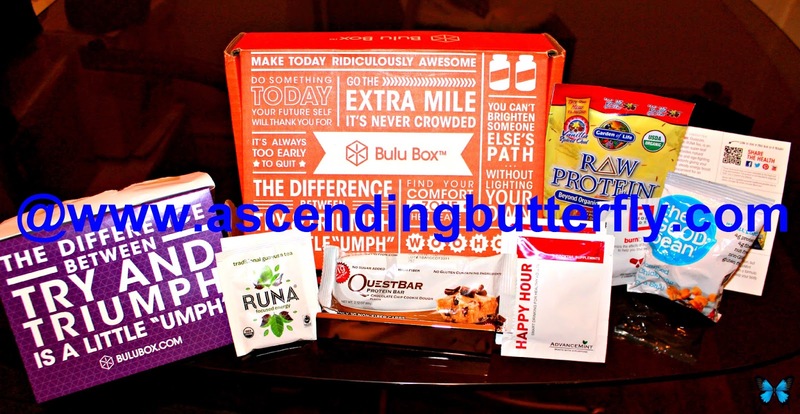 A Bulu Box has been provided to Ascending Butterfly for Editorial Consideration. As always, all opinions are my own. I am disclosing this in accordance with the Federal Trade Commission 16 CFR, Part 255 - Guides Concerning the use of endorsements and testimonials in advertising, you may check our Giveaway and Disclosure Page for additional information regarding Ascending Butterfly Disclosure. Wow I never thought being healthy meant I had to be part of the Bulugan Nation (Passport needed LOL ? ) but it's nice to have healthy products come right to my door,beauty boxes are great but this kicks it up a noch !